The history of swimming is marked by truly heroic acts of individual achievement. The world will long remember Florence Chadwick, who in 1950 became the first woman to swim the English Channel in both directions, setting new records each time. Chadwick’s attempts to swim from California’s coastline to Catalina Island were initially stymied by thick fog, but she eventually made the crossing by picturing the shoreline in her mind. That kind of mental determination is also evident in another, soon-to-be-historic swimmer. 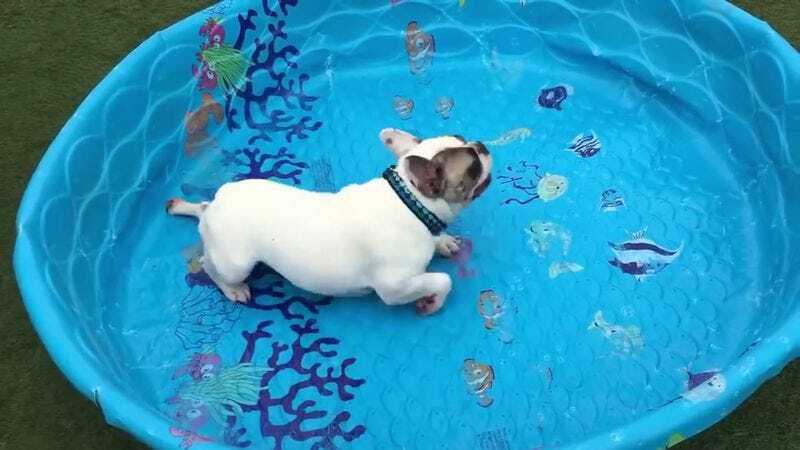 A French bulldog from Halifax, Nova Scotia, has proven that one does not even need water to swim. In a 31-second video posted to YouTube, the indefatigable animal paddles gracefully around a completely empty plastic kiddie pool, seemingly oblivious to the fact that it contains not a drop of water. Apparently, the pool’s blue color and wavy design were sufficient to create the optical illusion. The colorful fish painted on the floor of the pool probably helped, too.